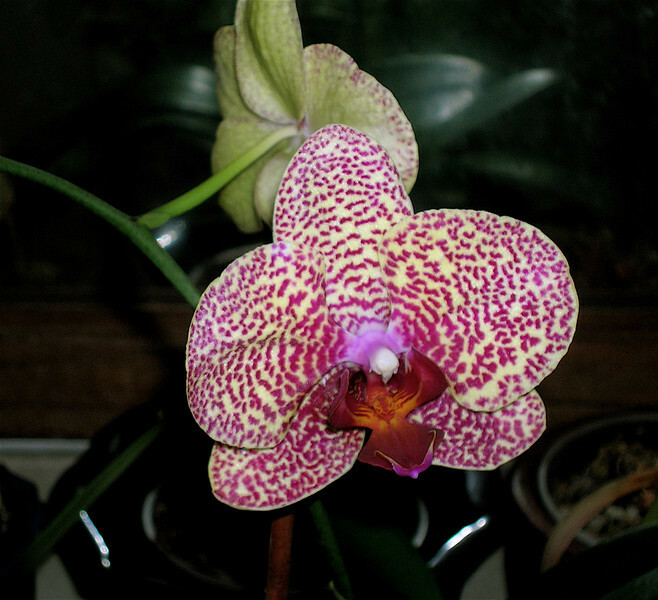 I've loved orchids since I was a young child, when my grandfather raised them commercially in six enormous greenhouses on his ranch in Southern California. Since I don't have a greenhouse, I turned a little used bathroom into a greenhouse of sorts - it has a frosted window with bright southwestern light, and has proven to be the perfect place to grow orchids. I mostly grow Phalaenopsis, because they're the easiest to find, but sometimes I'm lucky enough to find other varieties that manage to do well in my "Greenhouse In the Loo". I don't have the correct names for very many of them, but I'm discovering the names of some of them the more I read about these fascinating plants.